This 'Family Story' is a little different than all the others. It''s not even really a family story, unless you consider the friendship, camaraderie and true understanding between three teenage girls fighting a very similar fight almost like a "real" family's bond. The resiliency of kids is miraculous and this couldn’t have been more apparent than when I got the chance to sit down for a chat with three girls, Hillary Husband, Kelli Silvester and Brittain McCoy, all of whom are staying at Ronald McDonald House® of Memphis while they are fighting the battle against cancer at St. Jude Children’s Research Hospital. Hillary Husband arrived at Ronald McDonald House® first, in the beginning of April, 2008 after being diagnosed with Leukemia. In the month since her diagnosis she has travelled back and forth between Memphis and her home town in Southern Louisiana. 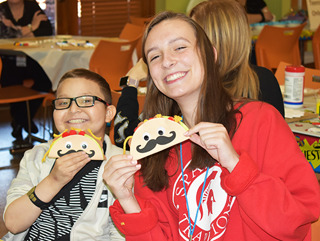 Kelli Silvester came to Ronald McDonald House® in November after doctors discovered a football sized tumor in her abdomen. Brittain arrived in mid-November, just one day after being diagnosed with ALL Leukemia. So what is was like to be a teenager being diagnosed with cancer, and moving to Memphis without any preparation? “It’s hard – hard to leave your friends and being separated from everyone is difficult. That and the fact that you have cancer, which kind of freaks you out in the beginning. But you get used to it…it’s much easier to cope with friends. It’s going to be almost as hard leaving, because this time I’ll leave these friends behind. I get to go home tomorrow!” says Hillary. “When I found out about my diagnosis, I started crying, I just freaked out. Then they told me I was moving to Memphis, my reaction was ‘why?’ Now I know” adds Brittain. 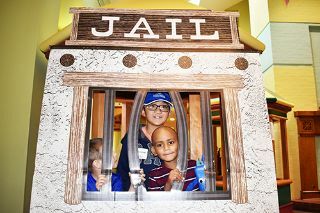 How about Ronald McDonald House®? "You know it’s so nice to have people that understand. We all have pretty good support systems at home, but they don’t quite get it. I usually wear a wig when I’m at home, so at least I don’t get the looks” says Hillary. The same sentiment is echoed by Brittain and Kelli. “They can’t get it, they just don’t know. They see us and think we’re doing really well, but they don’t understand how hard it is on a day-to-day basis. We understand each other. We know exactly what the others are going through. But I always rather have them ask questions than stare. Regular people don’t know much about this. They ask me ‘is it contagious’? They’ll say ‘I have a hundred questions’ – but that’s good. I just tell them ‘shoot’. But people stare. I’ve been called a guy before because most of my hair is gone from the chemo. I have to wear a mask when I go home. There’s nothing I can do. I have cancer. You can stare all you want to. But I don’t wear a wig…Hillary does”. At this point in the conversation, the girls became girls again and quickly started giggling. They then told me about a recent trip to Wal-Mart, where Hillary pulled off her wig in the middle of the store and the parking lot, just to get a laugh – “we have to have fun with it sometimes." Kelli immediately explained the ‘hair situation’. “We joke around about it. We tease Hillary’s hair. She has a natural Mohawk! I have absolutely no hair, my name is Cue Ball and we have Spike there, look at her! But seriously I think it’s mostly that people don’t know what to do. They think we’re fragile, like we’re breakable. Constantly watching us like we’re going to hurt ourselves. And it’s not like that at all. We have to understand our illness to go through it”. So what’s a regular day like? “On a regular day I get up, go to the hospital for blood work. Then you wait for the blood work to come back. Then you go to your clinics, see your doctors, maybe some school…” said Hillary. For Brittain it’s 3 hours in the medicine room every day. She has chemo Monday through Friday. 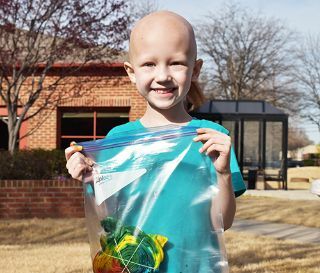 Kelli has radiation every day, “then in the afternoon we get to come home to Ronald McDonald House®. 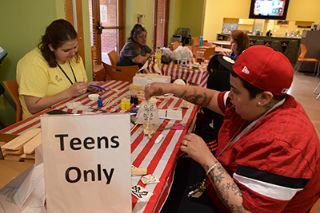 We spend each night, right here in the Teen Room. We start early and go from night to the morning. This is the official hang out spot for the cool kids. Thank you so much by the way…we can’t thank you enough for having this space”. “It’s great to get away from our parents for a little while” Brittain added. “We’re with them ALL THE TIME. It’s great because that’s who holds our hands when it’s hard but it’s also good to be without them sometimes. We have popcorn every night then we play Guitar Hero, watch movies or just talk all night. It just makes us feel like we can be what we should be as teenagers”. 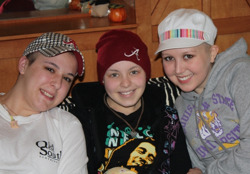 So what does Ronald McDonald House® mean to three teenage girls fighting cancer? “It’s HOME” said Kelli. “It’s home, when you’re not home. Because we call this place home, and when we refer to our real home, we just call it ‘home-home’. “I don’t know what we would do without it” added Brittain. “It’s great to have your own room, with your own pictures – you can’t do that in a hotel. And you can’t meet friends in a hotel. Honestly it didn’t even have to be this nice and it’d still be great. It’s just like a big mansion with lots of nice people”.